Maison Laurier oferece 3 quartos, cada um com casa de banho privativa, no chão e 1º andares da propriedade. No segundo andar, uma espaçosa sala de estar e WC separado. No último andar, uma cozinha amena, luminosa e totalmente equipada, com um terraço de ambos os lados para aproveitar o sol da manhã e da tarde. Maison Laurier é uma moradia de estilo antigo do século XVIII, recentemente renovada, no centro histórico de Uzès, a apenas 2 minutos a pé da Place aux Herbes. Espaçosos e luminosos com paredes de pedra expostas e tectos com vigas originais, todos os quartos têm casa de banho privativa. Como a casa tem duas entradas independentes da rua, foi projetada em renovação para permitir que, como um todo, acomodasse grupos de até 8 convidados ou dois apartamentos independentes para 6 e 2 convidados, respectivamente. Há equipamentos de alta qualidade e mobiliário elegante e decoração em todo o país. No último andar há uma espetacular cozinha e sala de jantar que abre para dois terraços na cobertura. O nível abaixo oferece uma grande sala de estar e WC separado. Os 3 quartos estão no chão e 1 º andar, juntamente com uma sala de escritório / televisão. Este apartamento acolhedor para dois tem uma cozinha / sala de estar e varanda com um mezanino e um quarto duplo espaçoso e confortável com casa de banho com chuveiro no andar de cima. Se você está procurando outras propriedades para alugar com a mesma alta qualidade de renovação e mobiliário interior, também alugaremos uma grande fazenda com piscina que acomoda até 12, a uma curta distância de Uzes (Home Away ref. 1078150), bem como uma moradia ligeiramente maior de 5 camas / 4 banheiros com um impressionante terraço de 80 m², também no centro histórico de Uzé (Home Away ref. 453391). Todos os banheiros são modernos, com acessórios de qualidade. Escadaria de pedra em espiral e níveis variados tornam difícil para carrinhos de bebé e cadeiras de rodas. After every outing it was a delight to return to this house. The top level with large kitchen/ eating area with lots of natural light was our favourite meeting spot on cool or rainy days and on sunny days we opened the doors to the two attractive balconies on either side to enjoy open air and privacy combined. The linen, furnishings and kitchen ware were all good quality. On the practical side, having three bedrooms with ensuites plus another toilet on the level below the kitchen made for comfortable living. Everything was perfectly clean and beautifully presented. Stephanie, the owner, was so helpful beforehand, answering all my questions and concerns. During our week in Uzes, Annie was always available for any immediate problems or questions. The house is in a quiet pedestrian street which leads to the centre of the town. We were 5 minutes walk from the Saturday and Wednesday market, 5 minutes from the little supermarket, Spar, and so close to all the restaurants and shops in this beautifully preserved and very lively town. There was a boulangerie at the end of our street for our morning bread and crossiants. We enjoyed three inexpensive and good quality restaurants, Les Deux Freres d’Uzes, Ma Cantine and the creperie Le Bolee. And there are many more restaurants that come with recommendations. It was a 35 minute bus ride to Nimes for our day trip, and not far to drive to Canoe Collias for our canoeing under the Pont du Gard. We enjoyed exploring the historical side of Uzes as well as walking in the beautifully peaceful Vallee d’Eure. The 1900 museum is fascinating, 5-10 minute drive or 35 minute walk out of town. The town is small enough to wander around and yet big enough to sustain lots of shops and restaurants. Although we had hired a car, we did not want to have to rely on driving every time we wanted to do something. Here we had the town so easily accessible and a house that was in a beautiful old building but modernised to allow for enjoyable and spacious living. It is on four levels but this is a part of life in a traditional French building and necessary if you want the spacious living areas. We loved our week in Uzes and this had much to do with the town itself and particularly to this charming house. Uzès est une ville magnifique, la maison est très bien située, à 2 pas du centre ville. Nous y étions avec des enfants en bas âge, je ne recommande pas cette location pour des enfants : la maison se situe sur 4 niveaux et les escaliers ne sont pas sécurisés ; alors à éviter pour des enfants qui apprennent tout juste à marcher ou qui sont encore petits. Another fantastic vacation in Uzes! The house at Grande Bourgade was perfect for our family of 5. This is second time we have rented one of Stefanie’s properties and La Grande Bourgade property did not disappoint. It is well furnished and decorated. Despite the record heat wave and lack of air conditioning, we managed to stay ‘cool’ by opening the doors to the terraces and creating Cross ventilation of the kitchen. There were floor fans in the bedrooms and kitchen which helped with the 40 degree heat during our two week stay. We love the location and proximity to some of our favourite spots in town. Veronique was incredibly welcoming and checking in and out was seemless. Thanks again for allowing us to stay in your wonderful home. It was a pleasure to have you all back to stay. Well done for surviving this year’s exceptional heat wave! I’m glad you enjoyed the location as much as Maison Théodorit. Uzès really is all about wandering around the beautiful historic centre and enjoying the market square, shops, cafés and restaurants. Maison Laurier makes the perfect home base for a holiday in the beautiful old town of Uzes! We had a wonderful week at Maison Laurier. The home has character and charm while being tastefully renovated and furnished. We were four, (one couple from Vancouver Island and the other from Adelaide), although there are enough bedrooms to accommodate six and plenty of bathrooms. 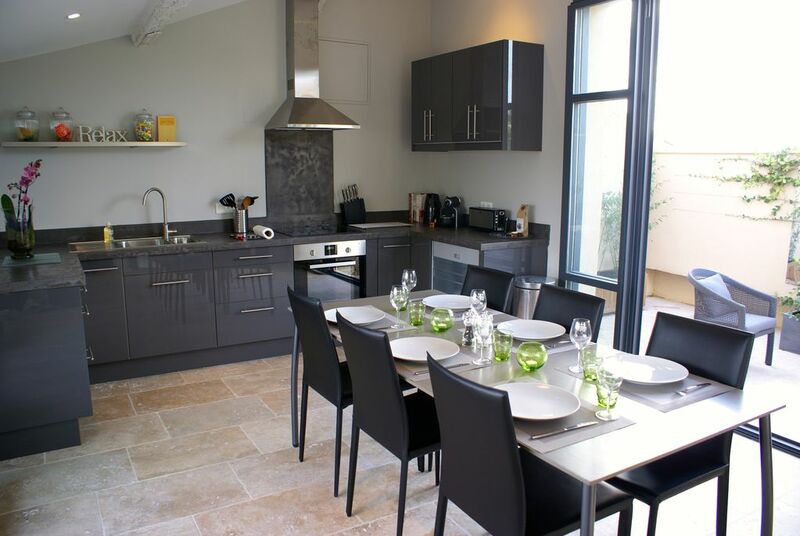 The large kitchen on the top floor is the hub of the home, with modern appliances and well stocked with dishes, etc. There are two decks, offering morning and evening sunshine, and the living room on the third level is comfortable for relaxing. Maison Laurier is located on a quiet street with a boulangerie at the top and a short walk to la Place aux Herbes for shops and cafes. We highly recommend Terroirs for lunch and tapas and just around the corner, Ten is a fabulous restaurant serving delicious nouvelle cuisine - owner, Kate, from Devon is delightful! Maison Laurier's owner, Stephanie, was extremely pleasant and helpful when we were making the booking for our trip and we were most impressed with her attention to detail. Her greeting party, Annie and Veronique, were friendly and prompt. We always managed to find a parking spot close by. Uzes is the perfect size - not too big to feel like a city but large enough to offer all the shops, restaurants and attractions you could need. A highlight was the walk through the park and up la montaignette for wonderful views of the town in the distance. My only caution would be to people who can't handle stairs - the home is on four levels - but we all enjoyed the much needed exercise to work off the morning croissants!! I wouldn't hesitate to recommend Maison Laurier and hope we can return one day! Thank you for taking the time to write such a comprehensive and wonderful review. I am so glad you enjoyed the house and all Uzès has to offer. That is our goal! We also hope you can return one day. It was a pleasure to have you to stay. The property is in a quiet neighborhood with private parking nearby. We were traveling to the south of France to attend a family wedding at the Pont du Gard, and wanted to spend a few days in the area before the wedding. Uzes is a great town, and terrific location for touring the area. The house is spacious and has a great kitchen with two terraces outdoors. It was very well supplied for cooking and entertaining. We loved our vacation there. Uzès é uma cidade medieval bem preservado na borda da Provence. É facilmente acessível por via aérea (Nimes, Montpellier e Marselha) e comboio (Avignon, Nimes TGV / Eurostar). Há muitas atrações locais para todas as idades e gostos, que vão desde o famoso aqueduto romano chamado a Pont du Gard, no Rhone e Chateauneuf-du-Pape, o palácio Ducal & catedral, antigas lojas / feiras de degustação de vinho local. ..e para crianças, visitas à fábrica de doce Haribou, caiaque no rio Gardon locais & the Water Park Bouscarasse. Uzès é conhecida por seus programas de verão de dança e de música clássica, assim como as festas tradicionais com bull-correndo pelas ruas. Instalações locais são excelentes, com uma piscina pública ao ar livre na cidade e quadras de tênis, aluguel de bicicleta e grandes passeios / caminhadas / jogadas. A produção local é espetacular e há uma grande variedade de restaurantes e bares para todos os gostos e orçamento. Há muitas lojas interessantes e boutiques em Uzès ... com roupas, decoração de casa e jóias bem representados. Muitas das aldeias vizinhas são muito bonitas e apenas 1 hora de distância são as praias do Mediterrâneo, a área de Camargue e os desfiladeiros e planaltos do Cevennes & Gorges du Tarn. As famosas cidades de Avignon, Nimes e Arles estão todos dentro de 45 minutos de Uzès. Our aim is to provide a high end service: a spotlessly clean property on arrival, personal check-in and check-out, all house linen and towels provided, free WiFi, on-hand support during your stay and local recommendations to help plan and enjoy your time in Uzès. We can also arrange airport or train station collection, additional cleaning, grocery shopping, a chef at home and babysitting services. Please contact us with your request. Payment terms: 25% deposit required to confirm your booking. Remaining balance payable 60 days prior to arrival. All payments are to be made in Euros for the complete amount with any transaction costs paid by the guest. Refundable security deposit against damage: €500 which will be refunded within 7 days of your departure assuming no damage to the property or its contents. Changeover day: This is usually Saturdays with arrivals between 4-7pm and departures before 10am. We will be flexible whenever possible. Late check-in may be possible for a fee of €15. We recommend that you take out insurance against cancellation due to unforeseen circumstances. NO smoking and NO pets allowed on premises.